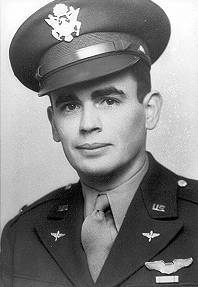 Now, the 100th group had a real bad reputation as far as coming home was concerned, and I immediately appealed to the colonel, Colonel Edgar Wittan, who was later killed in England, and told him that I didn’t want to fly with the 100th. He said, well, everyone was going on the same mission, and I should go over and fly with them; if I didn’t like the way they were flying, I could come over and join the 390th again. He said they were real short of planes, and they wanted enough to make a group. We took off before the 390th on a mission to Munster in Germany; it was on Sunday, a nice sunshiny day, a beautiful day, beautiful fall day. The target was a built-up section of Munster, and I thought it was rather inappropriate that this large set of steps to one big building in Munster was picked out as the aiming point. I’m not sure now whether it was a church or not, but it seemed to me that it was. Anyway, we took off before the 390th and flew over to where the 100th was assembling. They had 16 planes in the air when I arrived, and the other plane from the 390th had some kind of trouble, either real or imagined, and went back and landed at our base. I circled in formation with the 100th and got in position and took the #5 spot in the high squadron off to the right and above six planes; there were six in the lead, six in the low, and five of us in the top squadron. We got the group all assembled, and the wings started to assemble, and two of the planes from the 100th dropped out. And so then I was in the #3 position, or #2 position; I went up to #2 position in the high squadron. Just as we started to cross the North Sea, why another 100th plane turned around and started for home (aborting, they called it in those days), and the remaining two planes were just side by side, and so I pulled up in the lead and I led the high squadron, which then consisted of two airplanes. The other airplane was a 100th group plane and had a square D on its tail and we had a square J on our tail. We crossed the North Sea, or north edge of the English Channel, and headed into Germany. We had a little fighter support for protection until we got just about to the coast. We went in and headed about towards the Ruhr, the Ruhr Valley. The formations were pretty tight; our group was leading the wing, which consisted of three groups, and the 100th was a little bit lower, and then came the 390th and then the 395th. ell, we had just turned at the initial point to head towards Munster; we were still about, oh, 20 minutes away from the target, and we were heading northeast. We made a shallow turn to the left and were heading northeast; the sun was behind us. And seemingly out of nowhere two fighters came in from about 6 o’clock, a little bit high, and they shot up the lead plane of the group, of the 100th group, and on the radio gun, the handle dropped and just pointed right straight up in the air, so we figured they were in trouble. But when we looked in the plane, we could see in the windows. We were close enough; we were about, oh, maybe 200 feet from it. There seemed to be a lot of activity, but it was… it didn’t make any sharp turns or anything like that as if it was going to leave the formation. The only thing it did do was slow down, and when you are leading a group and you slow down suddenly, it causes quite a consternation among the other pilots. We slowed down with them. I just had the one man on my right wing, and he was able to stay behind me all right; that was the most difficult part of formation flying, was the slowing down, because if anyone in the lead slows down, it takes a little while for the others to keep from overrunning. Well, not only did he slow down, but he started losing altitude, and we stayed with him for about, I imagine it was about four minutes, and the fighter attacks were really getting fierce then; they were coming in from the sides. And after we had lost about, I imagine, 2000 feet or maybe 3000 feet (we still had our bomb load, of course), the 390th group passed us, and they were about 2000 or 3000 feet above us. And by that time, our lead plane was smoking pretty badly, and the other 12 planes were still staying in formation, scattered out a little bit by the fighters and the slowing down of the lead plane. Well, right then I took my group commander’s advice, and I said, “Well, this is it,” so we put on full take-off power and closed up the cowl flaps as much as we could, and we started to join the 390th. And the man on my right wing (who I think his name is Rosenthal, but he was written up in the “Stars and Stripes” as the only survivor of the 100th mission), he stayed fairly close, so he evidently put on full power too. And we climbed it seemed like an eternity before we could ever catch the 100th, I mean the 390th, and this plane on our right wing stayed fairly close, and there were several fighter attacks on our two planes at this time. However, I think most of them were finishing off the 100th, the 12 planes that went on down with the leader. As soon as we put on take-off power and started to climb and saw the opposition and the position we were in, we dropped the bombs. And, as far as I know, my right wing man did too. By the time we had reached the 390th, they had already turned right into the bombing run. They turned a little left to go into the bombing run; we were able to cut ’em off a little, and they had about 16 planes left at that time. We dropped into the #5 spot in the low squadron, and I lost track of the other 100th plane; I don’t know where he went, the remaining 100th plane. We flew northwest, mostly west, from Munster, and the fighter attacks were just ferocious; the guns were just going all the time. And we had one fighter who came in head-on from 12 o’clock level, and he wasn’t firing. Just before he got to us he kind of dropped down and we raised up a little bit, and I still think he must have been shot, because he did not shoot at us at all; he just flew right through the formation, the bottom half of the formation. While this was going on, the 390th lost two more planes from fire and from enemy aircraft, and we moved up to the #4 spot in the low squadron. And it must have lasted about 20 minutes, I guess, before some 51’s and some 47’s came over just about, oh, they were inside of the Netherlands, I guess, a little ways, but, of course, they couldn’t go clear to Munster, and we were naturally very tickled when they showed up and then the German fighters left. And just about the time they showed up, we lost another plane from the 390th in the low squadron, and then I moved up to #3 position in the low squadron and there were, I think, five in the lead and five in the high. Two more planes were lost on the way home, and when we got back to the 390th airbase it was all socked in; it was all foggy and cloudy, couldn’t see a thing, so we went on to the base where the 100th was stationed, and there were three of us landed there that I know of. I landed first, and then William Cabraille landed in “Eight Ball,” and his plane was shot up a lot worse than ours; he had an engine out, and he ran off the end of the runway–but I don’t think there was anyone actually seriously wounded in his plane as there were none in ours. We went into the debriefing room, and of course there were a lot more debriefing tables than there were crews to fill them; there were only three crews in there, and we had just started our debriefing and everybody was certainly relieved to be back on the ground. Our plane was not flyable; I mean it wouldn’t take off again without a lot of repairs. And while the intelligence officer was questioning us on the enemy attacks and the bomb strike and things like that, why there was a telephone call, and they wanted the pilot of the 390th plane that flew with the 100th, and so I went in this office and picked up the phone and said, “This is Lieutenant Harris,” and the voice at the other end said, “This is General … “(I cannot remember his name now) [very likely it was General Curtis LeMay–A.H. ], but it shocked me so when he said “General” I just about fainted. And he wanted to know what happened to the 100th; he said there were 12 planes missing, so I told him everything I knew about the mission, and he wanted to know how far into the mission that they were shot down and things like that. After I had told him everything I knew, why he said, “Thank you,” and I hung up; that was the extent of my conversations with generals. I went back to the debriefing table, and the boys made their claims. We had five fighters shot down, confirmed that day, from our plane, which was at that time the most, I guess, on any one mission. The whole group shot down 57 fighters claimed, although I am a little suspicious of some of these figures myself. I only know of actually two that were shot down by our gunners that I could see; of course, the pilot’s compartment of a B-17 gives you a very limited view of the enemy attacks unless they are head-on or from the side, and the only one I saw that I could confirm was completely demolished was one that came up from about 11:30, low. Oh, he came up at an angle of about 30 degrees, and I think it was the navigator that got him, but the others, of course, I couldn’t see. The top turret gunner got one, the tail gunner got one, and I think one of the waist gunners got one, maybe the ball turret gunner; anyway it was a big day, and we were really tickled to be back on the ground.